The grab sampling program requires the collection of duplicate water samples every month with the purpose to quantify seasonal patterns of nutrient and chlorophyll concentrations in different estuarine habitats (marsh creek, cove, surface open water, bottom open water). 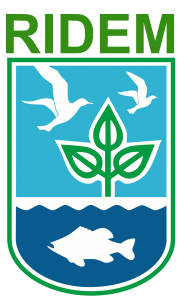 The diel sampling program requires to collect a series of samples from one station over an approximately 24-hour period each month to examine how nutrient and chlorophyll concentrations change over diel and tidal cycles in the Bay. 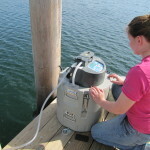 Here research staff is preparing the automated sampler to collect diel samples. 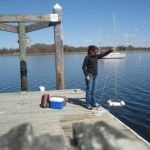 Complementary to the existing long-term water quality monitoring program, the NERRS implemented a new nutrient and chlorophyll monitoring program in 2002. The two sub-components of this program include monthly grab sampling at each of the four water quality stations, and diel sampling once a month at one site. All collected grab and diel samples are analyzed for concentrations of ammonia (NH4), nitrite (NO2), nitrate (NO3), phosphates (PO4), silicates (SiO4) and chlorophyll a.